Fossil fuels remain the dominant source of energy, supplying 78 percent of world energy use in 2035. 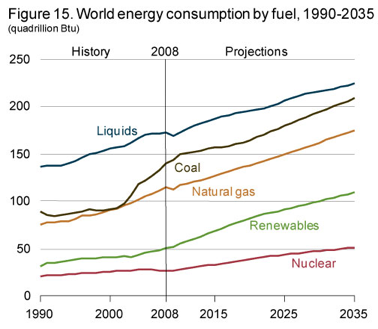 Petroleum and other liquid fuels remain the largest energy source worldwide, but its projected share decreases from 34 percent in 2008 to 29 percent in 2035. Natural gas is the fastest growing fossil fuel with consumption increasing at 1.6 percent per year, reaching 169 trillion cubic feet by 2035, an increase of 52 percent from 2008 levels. Unconventional sources of natural gas (shale gas, tight gas, and coal bed methane) factor prominently in the forecast, particularly for the United States, Canada, and China. World coal consumption increases at a rate of 1.5 percent per year, reaching 209 quadrillion Btu in 2035, 50 percent higher than 2008 levels. 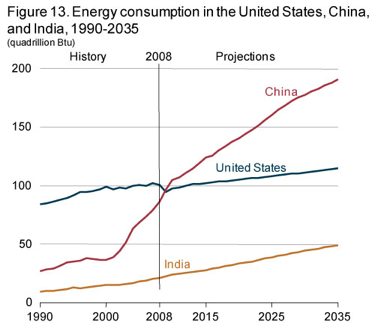 China accounts for 76 percent of the projected net increase in world coal use. Renewable energy is the fastest growing energy source, increasing by 2.8 percent per year. But even at this growth rate, its share of total energy use grows from just 10 percent in 2008 to 15 percent in 2035. 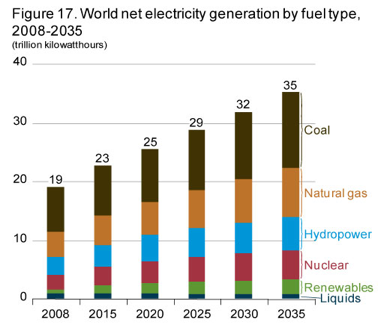 Electricity is the fastest growing end-use fuel, increasing at 2.3 percent per year between 2008 and 2035. Within the generation sector, renewable fuels grow the fastest at 3.0 percent per year, followed by natural gas at 2.6 percent, nuclear fuel at 2.4 percent and coal at 1.9 percent. Transportation energy use increases at 1.4 percent per year. Its share of total petroleum consumption increases from 54 percent in 2008 to 60 percent in 2035. Transportation energy demand is projected to account for 82 percent of the total increase in world petroleum demand. Energy-related carbon dioxide emissions are expected to be 43 percent higher in 2035, increasing from 30.2 billion metric tons in 2008 to 43.2 billion metric tons in 2035. The majority of the increase is from energy consumption in developing countries, particularly countries in Asia. Forecasts by government agencies indicate the fossil fuels will continue to be the dominant source of energy well into the future. While renewable energy increases at a faster rate than other fuels, its contribution will remain a small share of total energy requirements by 2035.